Stunning shot with lovely sky colors/reflections in contrast with the red buildings. You'd almost thing they were painted red to create this dramatic effect. The buildings appear orange to me. Nevertheless, it is such a unique setting with the snow covered mountains. The colors in the sky and the reflection are the perfect finishing touch. Beautiful photograph. Yes, I guess they are maybe more on the orange side than red....maybe red-orange? Reminds me that monitors vary widely as well. A very nice photo, but I agree that the usually red buildings do appear orange. 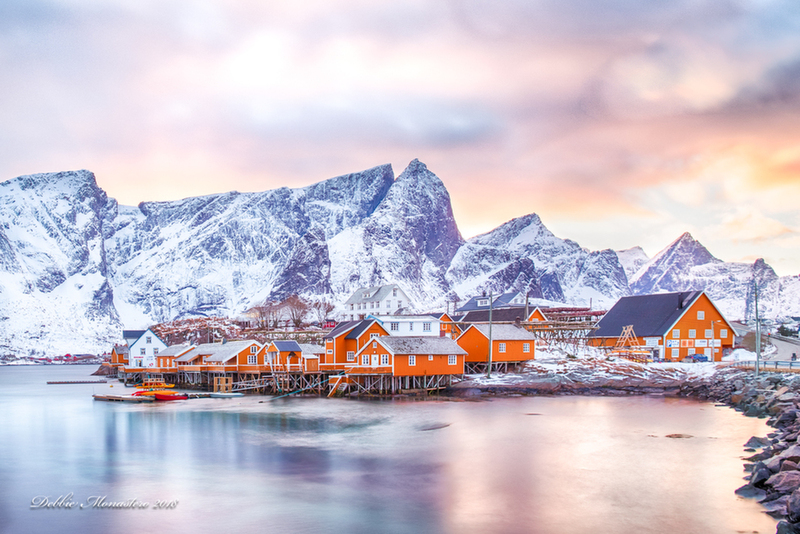 Thank you everyone, but while many villages in the Lofoten Islands have red buildings, this village had orange buildings, and the setting sun really illuminated them. Further research shows they have red, orange, yellow - and various other shades in between. Variety is the spice of life! Such a beautiful spot! I'm curious about the colors though as most cottages in the area are dark red and they appear orange here. You are correct that many cottages in Reine are dark red, this image was taken in Sacristy and in this village, they were orange. Makes me feel cold just looking at this wonderful image. I like the long exposure effect on the water.